Insider Dog Training Secrets will help you stop the chewing, barking, and digging. Right now. ...when you can listen to the advice of TEN DOG TRAINING EXPERTS? 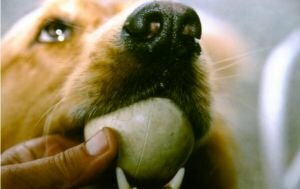 Dog with a ball having some fun and doing some dog obedience training. After getting advice from the TEN experts in Insider Dog Training Secrets, I became confident and effective. Just like you will be. Why Get Advice from Just One Expert? When you’re looking for advice, do you just ask one person? Of course not! That doesn’t make any sense. You need a lot of feedback. You need many opinions. That’s exactly why I avoid books written by just one guru or one expert. They don't have all the answers. You want many opinions. You want the inside secrets of several experts. Insider Dog Training Secrets is a collection of TEN articles written by TEN experts. You don’t get one opinion or one point of view, you get TEN. How wonderful. How smart! What is included in Insider Dog Training Secrets? Insider Dog Training Secrets isn’t just for one type of dog in one situation. It is training advice for all breeds and sizes of dogs. Again, why focus on just one breed? It doesn’t make sense. The training advice applies to all types of dogs. No waiting. Your copy is immediately available. No cost for shipping and handling. Instant delivery. You can print out as many copies as you need. You can reference your copy as much as you want. Insider Dog Training Secrets is completely and totally guaranteed. If after 60 days you aren’t happy and satisfied, I will refund your money without any questions asked. This book is 100% guaranteed. If you have a dog problem right now, this is the book you’ll want. Get results immediately with NO RISK. Your dog will love the new training methods you use. Your relationship with your dog will get better because you’re using the tools, tips and tricks of TEN experts. Every article by every expert in Insider Dog Training Secrets is written in plain English. The advice is simple but effective. The ideas are fun but they are useful, and completely guaranteed to work for you. The experts don’t waste your time. Each article is short and to the point. Also, I summarize the key points, just to make sure that the concepts are completely obvious. Remember, I’m not an expert. And that’s exactly why I’ve added these summaries for you. I keep it real. Insider Dog Training Secrets isn’t a history lesson and it isn’t full of fluff. The experts get straight to the point. They give you what you need to keep your pet happy and healthy, and they give you peace of mind. Why waste time yelling at your dog when you can create a loving relationship instead? I know that every dog is different and I know that every dog owner is different. Some methods work better than others. That’s why it is so critical to get advice on different topics from different experts. Start right now. I wish you dog training success!